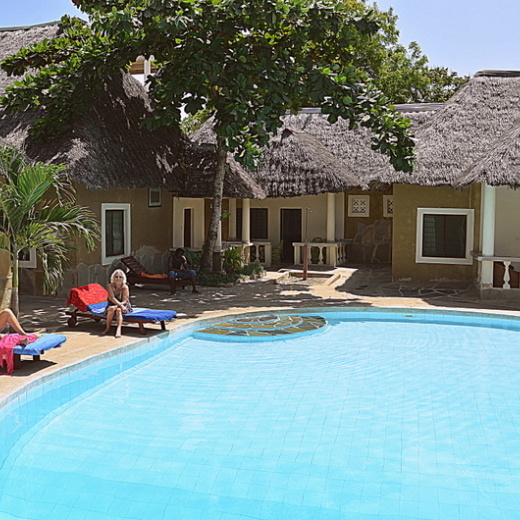 Winds Bar & Restaurant; The front section of Diani Campsite Cottages is Winds Bar & Restaurant, a cosy food and drink haven serving breakfast to dinner, with a well assorted menu, from seafood such as calamari, lobster and prawns to pizzas and even quick snacks such as samosas and club sandwich. Clients can also enjoy amazing steaks such a grilled pepper steak, grilled T-bone steak, tasty 'nyama' and 'mbuzi choma'. The facility's bar has a large variety of beverages and refreshment available. Also available is a broadband wireless internet connection at a fee of Kshs 500 per day ( for those who wish to connect their devices) or Kshs 3 per min (laptop provided for you).